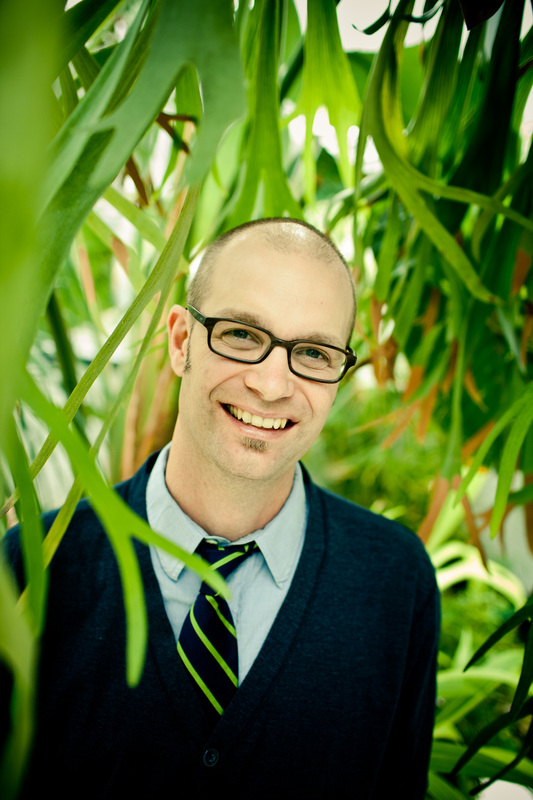 Guest blogger and Bucknell University professor Chris Martine, Ph.D., talks about guiding students away from their electronic devices and into the plant world. It is a pretty spring day. The sun shines through my office window, illuminating the old and worn photo on my desk. With the image is a handwritten note: “1912 photo of Bucknell botany class field trip.” Twenty-nine formally dressed students are shown sitting near a river, a specimen and an open floristic manual in each of their laps. Inspired, I stand up to look out my window at the plants in bloom in my campus view. I wonder if the present-day students walking past have seen them, too, and are just as impressed as I am by the chromatic exhibition. In order to help them understand and appreciate the nature of life on Earth, today’s students must first be taught how to see. 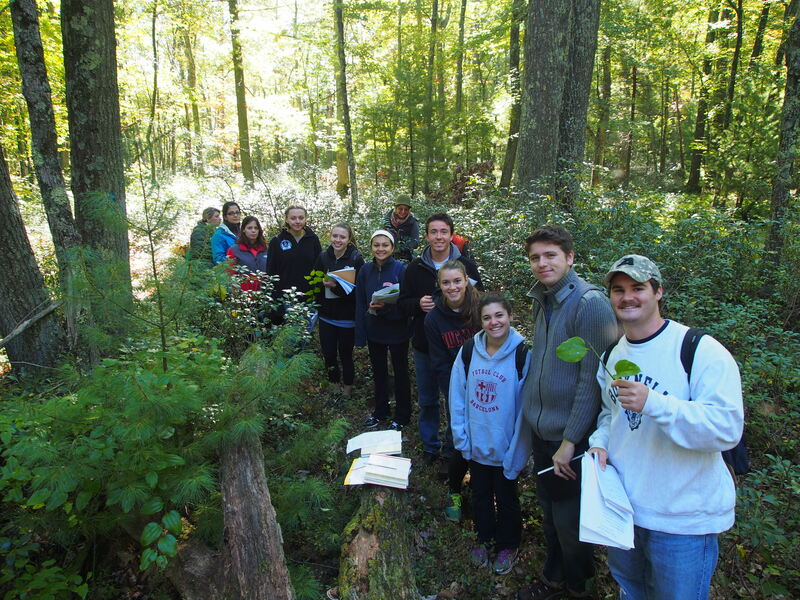 Chris Martine, Ph.D., brings his college students into the forest to learn to identify plants. They are learning to see plants a new way, through methods Martine encourages everyone to adapt: putting down electronic devices and experiencing nature firsthand. The Mantid Syndrome describes the positioning of one’s hands and forelimbs when staring at and thumb-typing on a smartphone: hands in front of face, elbows bent in a posture not unlike a praying mantid as it prowls along a stem. Unlike the mantid, students exhibiting this syndrome are not scanning the world around them. Rather, they see nothing beyond the reach of the bouncing thumbs and swiping forefingers working their small glass touchscreens. The issue is not an unwillingness to discern the details of the nature in their world—it’s a fundamental inability to tear their eyes from their screens long enough to know that nature is even there. Guest blogger Chris Martine, Ph.D., brings botany to his students’ screens, but prefers bringing students to botany. This is dangerous, of course, and not just because “smartphone mantids” often walk in front of cars or into stationary objects. These tech portals may take a user almost anywhere and show them almost anything. Yet, at the same time, one also becomes all the more disconnected from a real experience in this world—especially an experience that includes a sense of connection to nature itself. Thankfully, there are potential treatments. One is to develop electronic education and outreach tools that meet people where they are—in virtual spaces. I have personally taken the plunge and joined this effort in a number of ways, including developing and hosting the YouTube series “Plants are Cool, Too!”, blogging for the Huffington Post, and peppering social media outlets with posts/shares/tweets about plants and biodiversity. Efforts like these can engender greater awareness, I think, but they are not enough. Unsurprisingly, the best way to connect people with the real world is still to get them outside, unplugged and in position to see real things in real places—just like my predecessor had done with his botany class a century before me. Plants, with their ubiquity, stationary habits, and approachable demeanors, are ideal subjects for teaching students to see. Experience has shown me that if you can see the plants in your world, all the rest starts to come unblurred. On a recent morning with my field botany class, I asked the students to look around the forest we were standing in. Six weeks into the course, I knew they would have a hard time finding a species in this spot that they couldn’t recognize and assign a name to. A short time ago this was not the case for any of them—and yet here they were, having learned to see in a new way, feeling perhaps more at home in a forest than they had in their entire lives. Not a “mantid” in the group—Martine’s field botany class gets a feel for the forest around them. 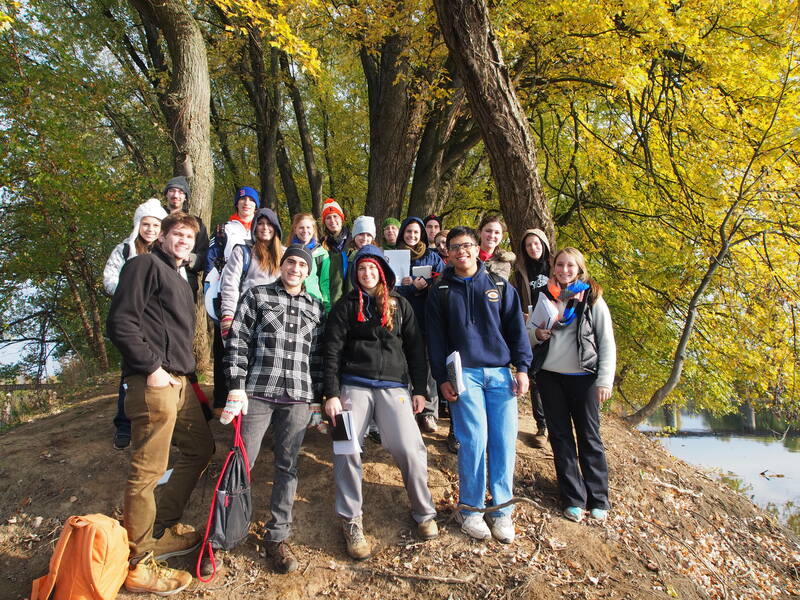 These students are lucky to have access to that forest—and lots of other wild places in our region—where they can develop and realize their new vision. But many young people are not as fortunate. For the more than 50 percent of the global human population in cities, finding places to become acquainted with plant diversity might be perceived as a challenge. Luckily for all of us, there are institutions like the Chicago Botanic Garden in cities around the world where people can visit, learn about, and come to love real plants. Botanic gardens are thus critical players in helping so many more of us learn to see. Even one special encounter with a plant can be enough to open a person’s eyes for good. With that last point in mind, I turn away from my office window and walk out of my building. In a moment I recognize a student coming my way, her face buried in her phone. I decide to intervene, and I keep it simple. Very heartening! I wish there were more young professors willing to take on the challenge of smartphone mantids. Previous Previous post: Orchid mania. Orchid fever. Orchidelirium!